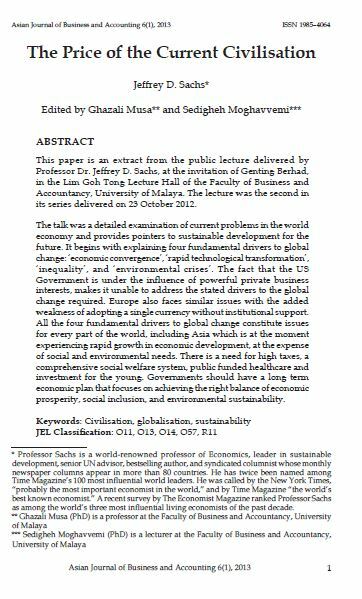 its series delivered on 23 October 2012.
weakness of adopting a single currency without institutional support. prosperity, social inclusion, and environmental sustainability. D. SACHS, Jeffrey; GHAZALI, Musa; MOGHAVVEMI, Sedigheh. The Price of the Current Civilisation. AJBA, [S.l. ], v. 6, n. 1, june 2013. ISSN 2180-3137. Available at: <https://ajba.um.edu.my/article/view/2663>. Date accessed: 25 apr. 2019.